Book Creator- Create your own story book with the advantages of adding your own photo, videos or drawing. Digits- A calculator for the iPad. Has a running tally, very useful for finding errors. ExplainEverything- A digital presentation tool that brings out the best of Prezi, Powerpoint, Interactive Whiteboards and is limited only by your creativity. Garageband- This classic music making tool has been remade to make music accessible for everyone, includes multi-track recording, looping, and smart instruments. Geoboard- Do you like a traditional Peg board but dislike cleaning up rubber bands? This app does what the original does but also has a built in calculator and the ability to annotate in the app. GreenScreen- Always wanted to be the weatherperson or a foreign correspondent? You can with this app, it allows you combine multiple images for that newsroom special effect. A green back ground will be required (try using your projector). iBooks- Store digital books from iTunes or ones that have been made in class using iBooks Author. 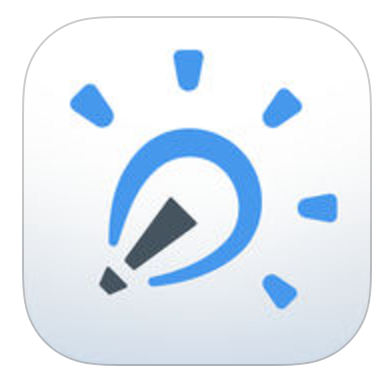 Inspiration- Modern mind-mapping, use words, photos or take your own photos on the fly. Kidspiration (same as inspiration, just a with graphics for younger students). iTunes U- an amazing resource for professional development for teachers or students. Content is free and is provided by major Universities, Apple Distinguished Educators and K-12 institutions. MoMa Art- A visual app, displaying art from the Museum of Modern Art in NYC. Moma Art Lab- Hands on art making, using the style of the masters. Puppet Pals 2- perform a play or show what you know with this fun puppet app. Stop Motion Studio Pro- Stop motion made easy, be creative and make some movies. Voice Record Pro—a straight forward app for recording audio. Explain Everything- An app that allows you to present information in a creative way, utilizing the best parts of powerpoint, keynote, prezzi and IWB software.